It’s a few days since the NES Classic Edition launched, and it is nearly impossible to find online or at retail stores. Unless you are Mike Friend. 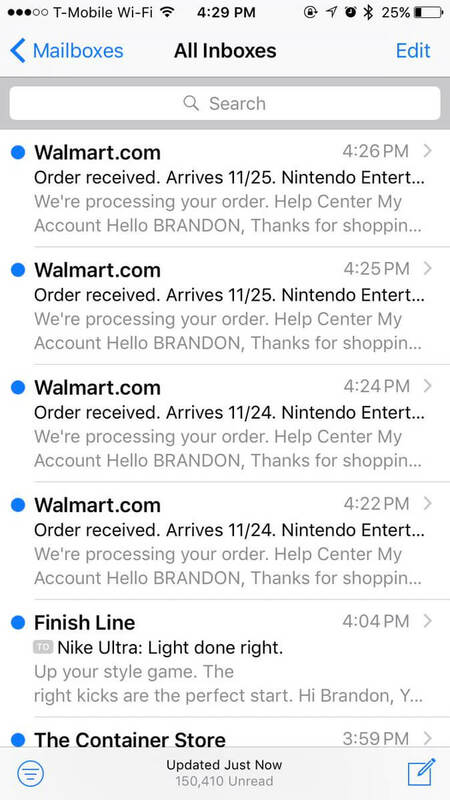 Friend (that’s a pseudonym) accidentally bought $500 worth of NES Classic Editions from Walmart on Tuesday. He was out running errands, and he wasn’t at home to turn off an automated software program (called a “bot”) that he uses to purchase items on Walmart.com the second they go on sale. The result was that he ended up getting multiple notifications from Walmart confirming his purchases of the NES Classic. It’s possible that while he was oblivious to Walmart.com running his credit card over and over for Nintendo’s hot new holiday item, that you were refreshing the page hoping to buy just one with no luck. If you’re already suspicious of Friend and his intentions for those extra NES Classics, well you have excellent instincts. Yes. Friend is one of a number of people who are going to every possible store to purchase every available NES Classic Edition to sell at a significant markup on sites like eBay and Amazon. People have already sold a few thousand NES Classics on eBay. Many are selling at $250, but at least one person looks like they might’ve paid $5,000. And let’s be clear: Nintendo is only charging $60 for this throwback retro console with 30 NES games built-in. The idea of buying an item in one place and selling it somewhere else for more money is not new. It’s an economic maneuver called arbitrage, and it started long before the NES Classic and even the PlayStation 2 or Cabbage Patch Kids. The formal concept goes back at least as far as the 1700s where traders would look for the best markets to make deals in an effort maximize their profits. But while 18th century traders were dealing with ships full of spices, today’s arbitrage resellers are using bots to deal with toys, Nike sneakers, and sundresses from Target. Friend is using a bot called Tai Ding, it’s a piece of software that you can’t find publicly yet from a developer called Ilene who also goes by the handle “PapaJawnz” on Twitter. He built this program a few months ago, and then shared it with a group of fellow developers. Tai Ding specifically works with Walmart.com right now, but PapaJawns is looking to add support for ToysRUs and Target. I caught up with PapaJawns to ask him about his bot. Basically, you can have this bot running on your PC, and you can set it up to search for “NES+Classic+Edition.” You also enter your credit card information, and then when the NES Classic is back in stock, the script will run through and make as many purchases as you want. Of course, if you use the keyword, you have to be careful that you don’t accidentally buy something with a similar name. “I’ve had a few people saying that the Tai Ding bought controllers or cases that they didn’t want,” said PapaJawnz. Or, in Friend’s case, you might forget that you left it running and end up spending $500. “Bots are stupid,” said Friend. But the bots are definitely getting the job done of snatching up NES Classic Editions. Even PapaJawnz is using his software to resell products. If this makes you angry, Friend seems to understand. But he also points out that him and people like him aren’t going anywhere. They aren’t doing anything illegal, and he points out that most corporations are getting better about producing enough supply to meet demand. He also notes that bots make it easier, but he’d still be out there without it. “We’re used to competing for stock, so even without bots we would most likely still be eating up all the stock,” he said. At the same time, the arbitrage reseller thinks that most people should just wait for Nintendo to catch up if they don’t want to pay more than $60. “The average person shouldn’t be losing sleep over [what I’m doing],” said Friend.